President Floyd’s passing has been hard. He was a special leader and this clearly shows with the outpouring of testimonials, newspaper articles, web pictures, and the WSU memorial service yesterday. Add this testimonial to the list. 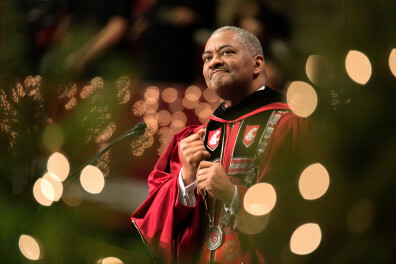 As a college, we felt a rather unique connection with President Floyd. While university presidents often have a tenured faculty appointment in the department for which they affiliated as a scholar, I suspect few presidents have that appointment in a college of education. But that was the case with Elson. I’m sure many were not aware of this. Certainly no one in the college ever thought Elson would come back to us as a faculty member, but we still felt a connection. Like good leaders do, Elson worked to not show favoritism to any individual or unit at WSU, including us. In fact, most in our college will remember that while I was serving as interim dean in early 2013, the president was quite hard on us due to our lack of university presence. He argued that we needed to make our own case for our contribution to WSU. While this “ruffled a few feathers,” I think he was exactly right in his criticism of us at that time. To the college’s credit, we embraced this challenge and put a number of initiatives into place: better university communication, particularly about our accomplishments; the development of strategic connections with various colleges and campuses; leading by example in the university’s efforts to provide better support and flexibility for the urban campuses. I want everyone to know that President Floyd was very pleased with the way this college rose to his challenge. He was openly complimentary of our work and performance. He mentioned this in university forums, meetings and receptions. And, like good leaders do, he made it a point to compliment the work, in person, directly to individuals in the college, including me. For many years, I didn’t know President Floyd except to say hi in the airport when I would see him (which was nearly every time I traveled). But as I transitioned to dean, and for several months afterward, I got to know him on a professional basis. I observed a top-notch administrator address difficult issues with strength, courage, grace, style, and integrity. I think it is fair to say that he viewed issues as problems to be solved. He was a consummate problem-solver. I became very impressed with him. I knew at that point the university had a special leader. Of course, this makes his untimely loss all the more difficult for the university community. 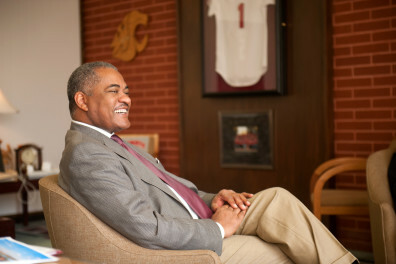 If you stroll the campus in Pullman you will readily see the impact President Floyd had on this university. The same can be said about the urban campuses, as well. Clear examples of his work and accomplishments include the new buildings, the Paul G. Allen School for Global Animal Health, a safer speed limit through campus, a state-of-the-art medical school building in Spokane, a Division I football stadium and other athletic facilities. On top of these is the imminent medical college in Spokane and the successful completion of a billion dollar capital campaign. There are many, many more. Once Elson appointed me as the permanent dean, all I ever wanted to do was to make him feel like he made the right choice. I suspect this won’t ever change. Because, when all is said and done, President Floyd’s best administrative and leadership skill wasn’t buildings. It wasn’t campaigns. It was people. His impact was certainly felt by the university infrastructure, its programs, and the ideas it holds dear. But even more so, that impact was felt by the individuals who help carry out the university initiatives. This is our time to mourn the loss of a fabulous leader and a special person. It is also our time to celebrate the president’s accomplishments on behalf of WSU. 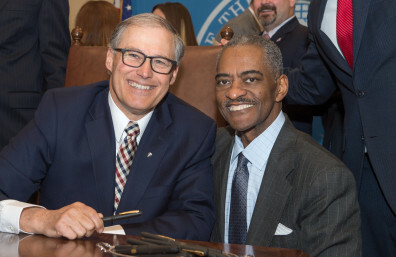 We can best pay tribute to President Floyd by working to carry out the initiatives he set into motion: initiatives that will catapult WSU into an elite group of universities, positioning us to have real impact in the lives of individuals and communities throughout Washington state and the country. As of a few days ago, I am now crutchless for a quarter to a third of the day and will be so for the next week and half. While I have looked forward to this with great anticipation, I must confess that it was a bit frightening at first, having been dependent on crutches for the last three months. On that first crutchless evening, my wife and I walked around our block, something I haven’t been able to do since early January. It was great! I felt good and quite optimistic. I was so excited that I had trouble sleeping that night. Much of my formula for success – and my belief in eventual full recovery – is the physical therapy I receive here in Pullman. The clinic I am a patient at, Proformance Physical Therapy, has been supportive and accommodating. I have a top-notch physical therapist and wonderful physical therapy aides who carry out directives from the therapist, guide me through rehab protocols and monitor the treadmill in the therapeutic pool that I’ll walk in for an hour each day, into July. The physical therapy aides are upbeat, see the world in positive terms, are highly professional, and are my cheerleaders. All of these individuals are WSU students or graduates, and three of them are graduates from the college’s kinesiology program! Proformance Physical Therapy has and continues to hire a number of our kinesiology students and it is clear they received both a quality education and are trained well on the job. It is great to see our graduates find work that is related to their undergraduate education. The three kinesiology graduates that work with me have high professional goals to pursue physical or occupational therapy as a career. The work opportunities provided by Proformance Physical Therapy make achievement of these goals a real possibility. As dean, I am very pleased with this vote of confidence for our graduates from a local business. The college’s kinesiology program had struggled for many years. While there had been several reasons for this, a key reason was that the college itself had not set it as a priority. This is no longer the case. In March of last year, President Floyd met with program faculty and students. While he saw firsthand the poor resources the program had, he also saw the potential the program has to make a real impact. As a consequence, the president jump started rejuvenation and revitalization of the program with resources that are now being used to establish the infrastructure for an exercise physiology lab. Since then, the college has hired two new tenure-track faculty members that will start in the fall and will outfit the exercise physiology lab and a biomechanics lab. The reason and resources for this are simple and straightforward. Kinesiology has approximately 1,000 enrolled students. I fully expect this number to increase each year for the foreseeable future. It is an enrollment-growth program and with the increased enrollment, generating additional resources that are, in turn, being used to build the program. This is a strategic investment in an undergraduate program that has rapidly become a major contributor in WSU’s push to enlarge its enrollment. I am proud of what the kinesiology program provides, the quality teaching and research that is being done, and the potential it has to offer a premier undergraduate education for students. My experience working with graduates of the kinesiology program at Proformance reinforces my belief that the earlier decisions made to invest in the program were the right decisions, decisions that will pay dividends for students and in turn, the community and beyond. As many of you know, I slipped on the ice and suffered a knee injury in early January. By the latter part of February I was on crutches and I remain dependent on them for the next few weeks. The good news is that I am clearly on the mend, making improvements each day. As of yesterday I have started a process of weaning myself from the crutches. I have another 12 weeks of rehab but could be walking unaided in 3-4 weeks. I am ecstatic about this positive turn of events. I want to thank many in the college who have asked about my status from time to time and have genuinely rooted for me. Know that the positive energy has clearly helped me stay focused and positive and is helping me to heal. Mike Trevisan addresses College of Education visitors from Thailand. Since February, his crutches have had many photo ops. It has been interesting to observe the reactions of people seeing a middle-aged person on crutches. Some don’t seem to know how best to react in seeing me. I particularly get interesting looks from people when Alaska Airlines carts me through the terminal in a wheelchair. And yes, while not always easy, traveling for business can be done. I have been on several trips now with crutches on airplanes, in taxis, and staying in hotels. I think what has struck me the most is how a set of crutches connects me with other people, particularly those that have had injuries that required long rehabilitation and recovery. I have heard many personal stories about multiple surgeries that required months, and sometimes years, to fully resolve. And if it was a leg injury, how long the individual was on crutches (sometimes for months!). Being dependent on other people has been probably the most difficult thing for me. It is humbling to be carted through the airport in a wheelchair. My wife Fran, has waited on me without complaint, to do things like iron clothes, move a glass of water from the sink to the table, or go to the store for me, all things I normally do myself. And in the office, my assistant Stacy Mohondro, has done much the same for me, including scheduling many doctor and physical therapy appointments around a packed schedule and somehow, making it all work. I anticipate 100 percent recovery within the next 3-4 months. Paradoxically, I feel very lucky. I will treat winter here on the Palouse quite differently. My faith in others has been re-affirmed. Most have rooted for me and I am grateful for this support.